Well I love love love working with this purple. I tend to carry this one with me and work on it in my breaks at work. Close up of recent work. I love the little things that keep appearing admist everything else. Like the flower below. It's the little things that jump at me when I am doing this. That make me smile as they appear. I'm half a page done now :D It is getting closer but most of the rest of this page is black! which will be interesting. It's state elections this weekend and I am getting so sick of both sides flinging propaganda at each other. Noone has a nice word and all they do is throw stones at the other. I wish we could survive without politicians! I'm really really looking forward to Easter this year as I'll be heading out to Boondooma Dam again. It is such a fun week away. Great progress on both pieces Caitlan. Gorgeous, just gorgeous. 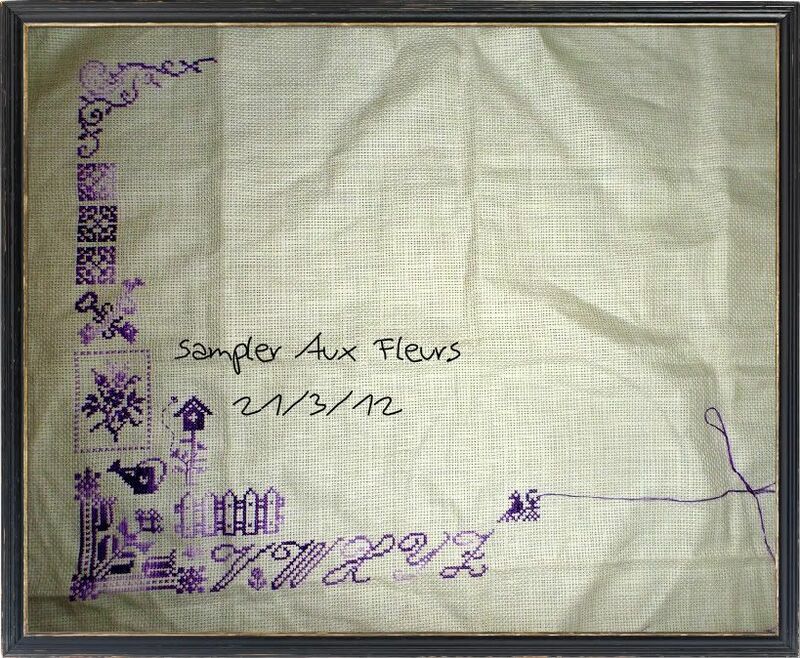 I'm really enjoying watching your progress on Sampler Aux Fleurs. Afternoon Tea is progressing nicely too. Caitlin, they are both wonderful and that Sampler is so pretty. Great job!! I hope the weather is good for your Easter trip. Is that purple one of those variageted threads? They're fun aren't they? Beautiful stitching! What floss are you using with all those purples? is it a single floss or are you changing colors out for all the variations? 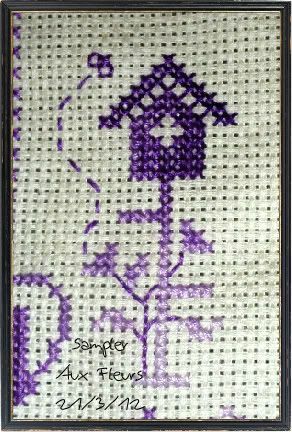 I love your sampler, that purple is so pretty. I hope you have a good Easter trip away. 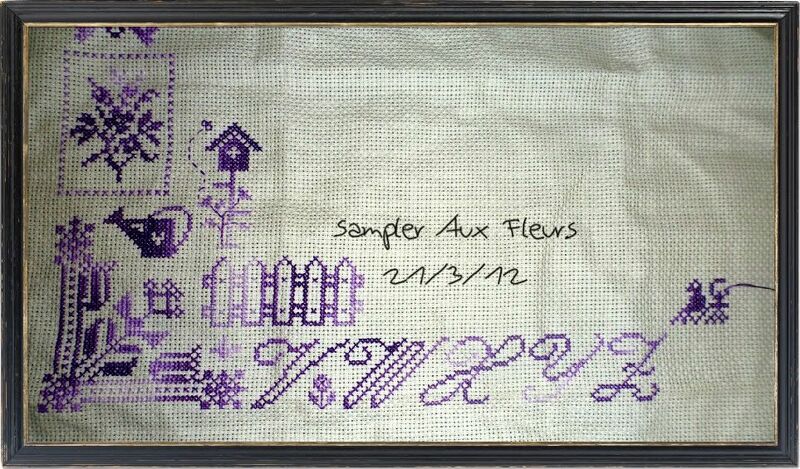 Your sampler looks so beautiful! I can tell you love stitching it, since you get so much done. I like both of your peices, and congrats on the progress with the HAED! The black will get boring, but you will wish for it when the confetti comes! Looking great! Wow! I love that purple how fun it must be to work with! Your over one piece is looking great! 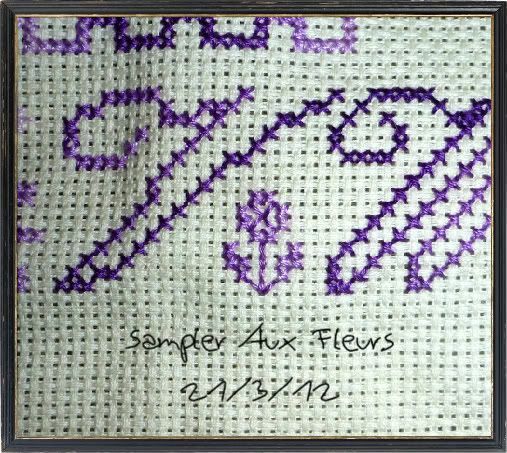 Lovely purple stitching =) Both your wips are very pretty! 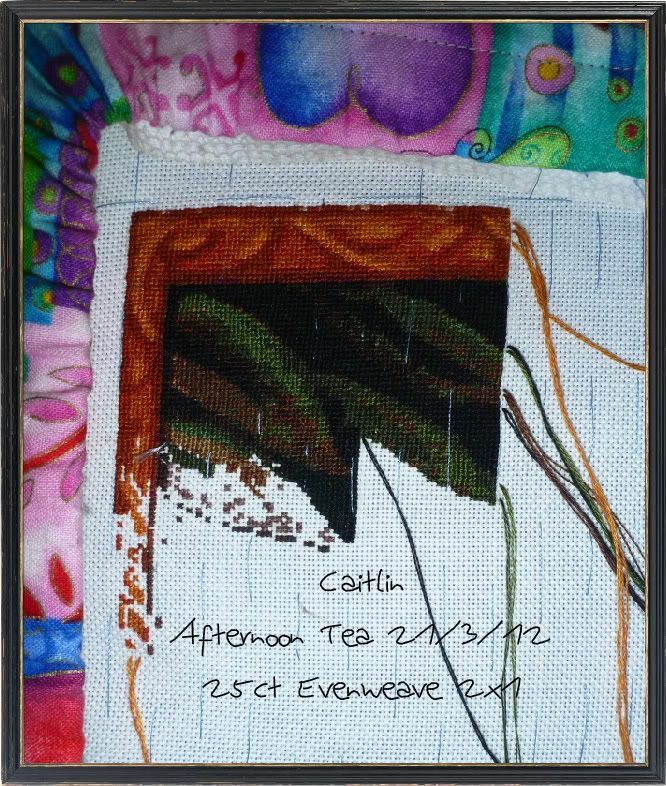 Love the sampler and you are just getting so much done on Afternoon Tea1 You'll be done in no time!